Hana: I'll welcome you back home. If you'd ever need to know why 2D animation is still relevant, or why the slew of 3D animated films can't seem to dent and push the former out of fashion, then perhaps Wolf Children encapsulates all the reasons why this is so. There's a lack of charm with the very clinical approach to animated films, especially with loads of images created digitally, and now for the 3D format, and this charm is always ever present in the traditional art form for the big screen. And don't forget that story remains king. Director Mamoru Hosoda continues on his roll with a brand of animated films that are extremely well received, because not only are they drawn to perfection in anime style, but also his films touches the emotional core on humanity, and this will inevitably move you with his style and delivery of such strong stories, whether written by someone else, as a film adaptation of novels such as The Girl Who Leapt Through Time, or like in Summer Wars and Wolf Children, stem from his own imagination. And what a fantastic reservoir of imagination he's tapping from as well, either telling stories with relevance to a digital age, or as in this case, a fairy tale like allure that is deceptively simple, yet concealing a very strong ode to motherhood. Yes that's right. For the most parts throughout this film, I thought it also resembled Yoji Yamada's Kabei: Our Mother, in the sense that this film takes on story proportions centered around a mother's unconditional love for her children, and the continuous strive to make ends meet and bring up her children to the best of her ability, inculcating a value system into her young ones. And the episodes the mothers encounter strengthen their resolve and determination, just goes to show the lengths they will go to in ensuring proper upbringing filled with love, care and concern. 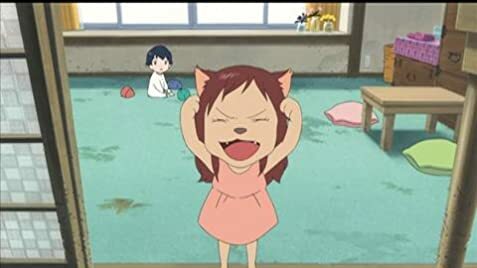 This simple narrative will undoubtedly move, only if it's done right, which Wolf Children did, complete with a fantastical element which provides a refreshing examination looking in, with a little bit of grotesque morbidity if one cannot look away from. I dislike to use this analogy, but perhaps it may strike an immediate chord with the current generation. Twilight has progressed and shown the decision Bella made to be with Edward, and in some ways, Wolf Children is like a what if to that scenario had she decided to be with Jacob. Hana (voiced by Aoi Miyazaki) meets up with a tall, handsome stranger in class (Takao Osawa), and before you can say Twilight, they fall in love, and it is revealed that her lover is a Wolfman. Undeterred, they begin a family, and soon Hana gives birth to the titular daughter Yuki and son Ame, before tragedy strikes and the family becomes a dysfunctional one without a father figure. Fearing that her children may be discovered to be wolf-human hybrids, with a number of scenes showing the challenges she faces such as their tantrums and uncontrollable changes, or the dilemma faced when they fall sick, she decides to uproot and move into the countryside, where life is simpler, neighbours are far away from one another, and there is room to, well, let her young ones roam in the vast grasslands and mountain sides. A new life beckons, and the film begins its homage to all moms having to struggle to bring up their children in unfamiliar surroundings, with little assistance, and plenty of inexperience. As a storyteller, Mamoru Hosoda excelled in character development, as we journey together with Hana in her upbringing, with the children endearing themselves to you in double quick time. They are adorably designed, drawn and brought to life, whether in their human form, or in animal form. We identify with everyone easily because of the inherent humanity Hosoda gives them, whether or not we are already a mom, or reflect that onto the challenges faced by our own mom's upbringing of ourselves. And both Yuki and Ame, besides their gender, have very contrasting qualities, from young to their teens, a tale told to just about the time where teenage rebellion and the need to forge their own independence take centerstage. There are plenty of episodes in Wolf Children that covers a spectrum of emotions, from comedy to those that will set heaviness in your heart. The innocence of the children will not get lost on you, and in fact will rub off you, while the pains of growing up will also touch a raw nerve, as Hosoda clearly knows which moments in one's teenage life to translate his story for the screen, bringing relevance the forgetting that the children were in fact more than meets the eye. And the animation is clearly Hosoda's vision in having details balanced with the occasional need for scarcity, which nailed it especially when the narrative calls for some distance either physically, or emotionally, and it's a stylistic choice that's already seen in a number of his films. Mamoru Hosoda set up his Studio Chizu with this production, and I'm really looking forward to more stories in the coming years. Meanwhile, Wolf Children is a must watch, and a clear favourite for the year. A little pity that it's not opening on more screens, but make your way to the Filmgarde cineplexes as this remains an exclusive to the chain. Meanwhile, I'm going to look back at Hosoda's filmography on DVD/Blu! 61 of 72 people found this review helpful. Was this review helpful to you?